Proposal for active recreation and sport, who want to experience a new kind of surfing and an unforgettable vivid emotions! Come to us and try HOVERBOARD BY ZR®! Innovative product as a platform combines the two streams of water used in Flyboard in one and releases it from the nozzles downward by man. Water pressure is sufficient to take off up to 5 meters above the water and develop a speed up to 40 km/h. Ice can be carried out as two people: one driver PWC and one athlete on the board, and one athlete thanks to Electronic Management Kit (EMK) - a console that is connected to the engine PWC, allows the user to control the PWC and enjoy riding on HOVERBOARD BY ZR®. HOVERBOARD BY ZR® allows you to fly, maneuver and perform a huge number of complex acrobatic tricks just above the water at high speeds. Athlete must choose a comfortable stance, determining which leg is behind, and what to come. Rear leg fixed mount, and then throughout the flight over the water it remains stationary. When the water pressure increases, the board begins to rise. To direct its movement can be shifting body weight on the leg, standing in front. For this leg is also provided for mounting, but freer. Airspeed regulated athlete by moving the center of gravity of his own body. For beginners it is recommended to switch stabilizer, located on the back of the board, the highest position. It will not allow the board to rise to its maximum height. Once you have mastered the technique of flight on HOVERBOARD BY ZR®, stabilizer can be installed in the lower position and rise above the water higher and higher. So, HOVERBOARD BY ZR® - it's speed and acrobatic flights over water and energy boost, adrenalin and vivid emotions for a long time! 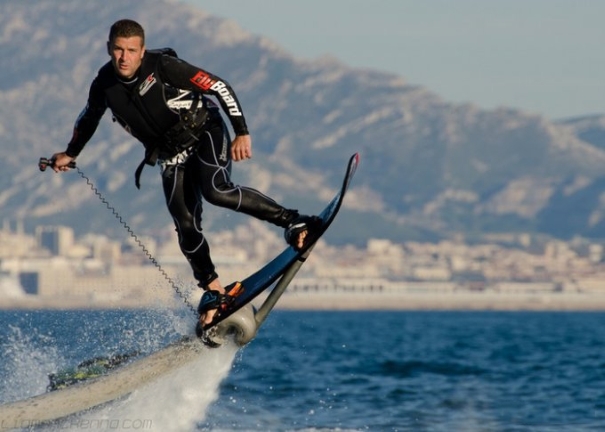 Skating on Hoverboard is a new sensation of flight and surfing, HOVERBOARD BY ZR® is an innovative product. Discover our new amazing product, available now in the Baltic.